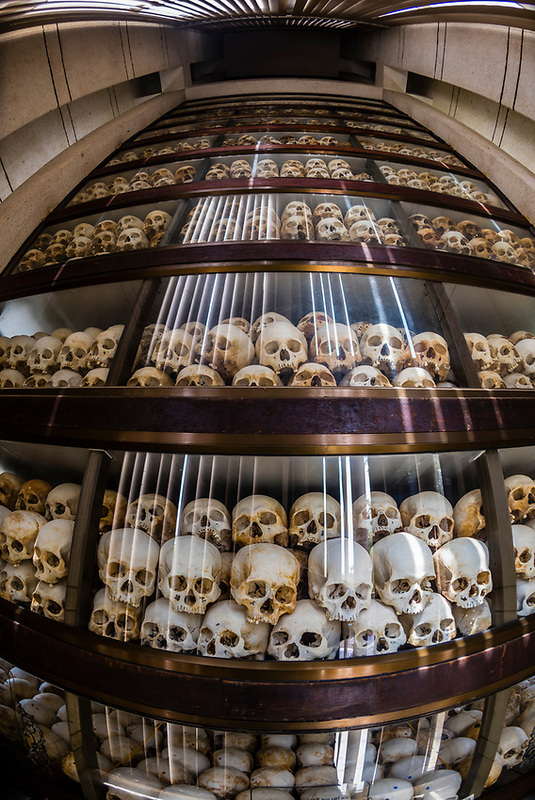 Inside the Memorial Stupa over 5,000 skulls of victims are displayed; Choeung Ek, the site of a former orchard and mass grave of victims of the Khmer Rouge - killed between 1975 and 1979 - about 17 kilometres (11 mi) south of Phnom Penh, Cambodia, is the best-known of the sites known as The Killing Fields, where the Khmer Rouge regime executed over one million people between 1975 and 1979. Over 17,000 people were brought here to be killed and buried in mass graves. Restrictions: This image is registered with the United States Copyright Office. ALL PHOTOS ON THIS SITE ARE AVAILABLE FOR LICENSE FOR MEDIA USE OR ADVERTISING USAGE OR FOR PURCHASE AS DISPLAY PRINTS BY CORPORATE CLIENTS OR PRIVATE INDIVIDUALS. ALL PHOTOS ON THIS WEBSITE ARE REGISTERED WITH THE U.S. COPYRIGHT OFFICE. COMP (COMPOSITE) PHOTOS ARE MADE AVAILABLE FOR LEGITIMATE CLIENTS ONLY FOR THEIR LAYOUT PURPOSES BEFORE LICENSING AN IMAGE AND MAY NOT BE DOWNLOADED BY THE GENERAL PUBLIC AS FREE PHOTOGRAPHY. DOING SO CONSTITUTES A VIOLATION OF MY COPYRIGHT AND YOU MAY BE PROSECUTED. NO IMAGES ARE WITHIN THE PUBLIC DOMAIN. USE OF ANY IMAGE AS THE BASIS FOR ANOTHER PHOTOGRAPHIC CONCEPT OR ILLUSTRATION IS A VIOLATION OF COPYRIGHT. NO USAGE RIGHTS OF ANY KIND ARE GRANTED WITHOUT WRITTEN AUTHORIZATION FROM BLAINE HARRINGTON III. BLAINE HARRINGTON VIGOROUSLY PROTECTS COPYRIGHT INTERESTS. IN THE EVENT THAT AN INFRINGEMENT IS DISCOVERED YOU WILL NOTIFIED AND YOU MAY BE PROSECUTED FOR COPYRIGHT INFRINGEMENT IN U. S. FEDERAL COURT WHERE YOU WILL BE SUBJECT TO PAYMENT OF STATUTORY DAMAGES OF UP TO $150,000 PER PHOTOGRAPH, AS WELL AS COURT COSTS AND ATTORNEYS’ FEES.